Big Apple Visual Group has the knowledge, experience and ability to provide creative solutions and innovative designs that support the demands in today’s Luxury, Beauty and Architectural world. We work with a variety of materials to fabricate numerous systems of display formats, high-quality visual props, digital graphics, dimensional letters, illuminated accents, special signage and branding decor. BAVG also specializes in the execution of national roll-out programs, unique visual installations and retail environments. We have the latest technologies, materials and production techniques available in the industry to take every client’s vision beyond their expectations. 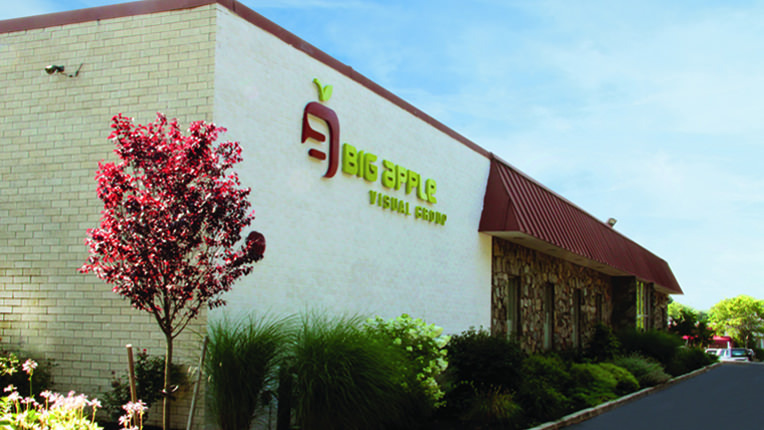 Big Apple Visual Group was founded in 1976 and has grown to become a leading provider of custom signage and visual display solutions. Some of the world’s leading brands benefit from more than 35 years of experience in design, engineering and fabrication for architectural, way finding and retail applications. Alongside our expertise, our continual investment in equipment has been a cornerstone of our success. We offer state-of-the-art technologies that serve every need from multi-location brand roll-outs to individual niche projects. 1976: Big Apple Visual Group was founded in a 500 sq. ft. with only two employees. 1978: Relocation to 5,000 sq. ft. facility, 10 employees. 1985: Relocation to 20,000 sq. ft. facility, 13 employees. More materials and techniques offered. 2001: Addition of 50,000 sq. ft. production facility in Long Island. 20,000 sq. ft. Manhattan facility retained as headquarters. 2001–2007: Many technologies added – laser cutters, waterjet cutter, CNC routers, large format and Lambda printers, direct-to-substrate printing. 2007: Architectural Signage Department for expansion in metalworking and wayfinding signage. 2012: LED embedded acrylic letters and LED panel capabilities enable completely new applications in signage and display lighting. 2014 - Present: Continued expansion of production capabilities, creativity and visual services offered to fulfill the demands of today’s industry. BAVG keeps up with the acquisition of new latest technology and its overall successful growth has increased staff beyond 100 employees. BANY ~ Opened since 1985, our headquarters in New York City facilitate the convenience of immediate access, samples delivery and meetings between BAVG Associates and Clients in NY Metro Area. Office is open Monday - Friday from 9am till 6pm. BALI ~ In 2001, projects demanding most state-of-the-art technologies led to opening of our 50,000 sq. feet engineering and manufacturing facility in Long Island, NY. While keeping up with the latest equipment and trends in the industry, BAVG continues expansion of its services and capabilities.